You have to love preserved historical towns like Old Salem, with old shops maintained just like it was 1700 again. Old Salem is a great place to learn about our colonial-era past, but it’s even more fun to experience while on a scavenger hunt, poking your head into all the nooks and crannies. Event Description: A fascinating, historic place to participate in a corporate teambuilding event,the Moravian church town of Salem Old Salem — founded in 1766 — survives today as a living museum that preserves the look and feel of colonial times—from the historic town square where the first Independence Day was celebrated to the famous Winkler bakery, where costumed “interpreters” prepare tasty cakes and cookies in the traditional fashion. 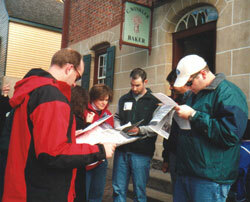 During your corporate teambuilding treasure hunt…you’ll explore the cobble-stoned streets and 200-year-old buildings of this old German settlement, including Dr. Vierling’s apothecary, nearby Salem College, and God’s Acre Moravian cemetery. So step back in time—both George Washington and Dr. Clue slept here! Hear what Dr. Clue Founder and President, Dave Blum, has to say about our Old Salem scavenger hunt.